Almost a year ago I bought a drilled and slotted rotor/pad/stainless brake line set from rotorpros.com. I got a great deal and saved around $150 compared to buying stock replacements at oreillys. Down side was it took 4 months or more to get the parts. Which really wasn't a big deal because I planned on running the old brakes until they died, which happened last week. Not long after I put new tires up front. I had a crazy shake in the front at 50-60 mph. Replacing the worn out tires seemed to get rid of the shaking, but I was told my upper left balljoint had to be replaced before alignment. But like I said the shaking almost totally vanished. 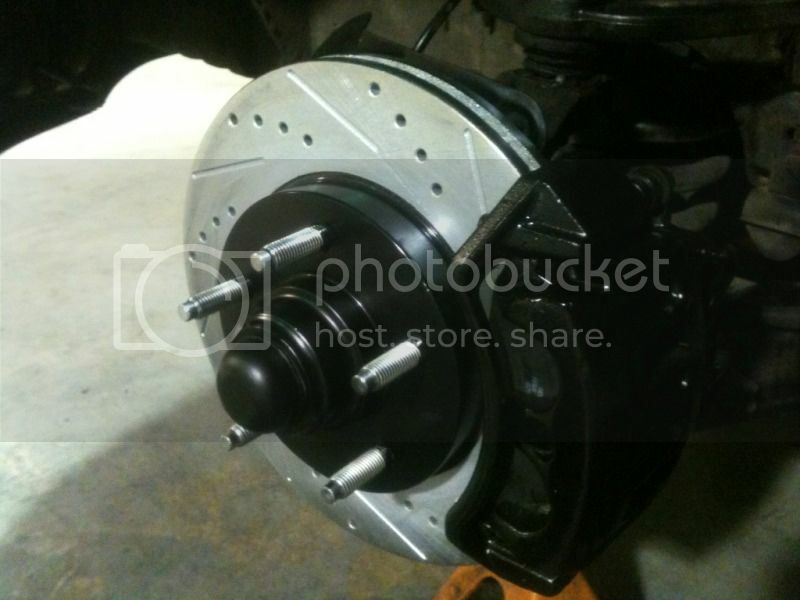 When the pads exploded, it was pretty loud, I got the rotors out of the box and installed them with new bearings. I even painted the calipers for kicks. I did not put the lines on yet because I didn't have a way to do a proper bleed. I'll put those on when I install my Bilstein shocks I got from MadEnterprise. Now all of a sudden the 50-60 mph shake is back. I guess I'm gonna have to get the rotors checked for runout or warpage. usually if its rotor related it will only do that when braking. I used to think that, and argued it till I was blue about my moms windstar. Changed rotors and the highway shake went away. Rotors can be warped at the just the brake ring, or in relation to the lug surface compared to the brake ring. If that makes sense. That's one thing I learned in tech school, they didn't offer much else. Lol. What usually happen is finned rotors, like on the front of our trucks, have weights in the fins for balance, maybe one fell out or never was balanced to start with? I saw this a lot on GM cars, not so much on Fords. I've seen a couple folks on here talk about getting warped rotors from rotor pro. I'll find out when they mic em. I've said it before and I'll say it again. I can't stand my rotor pros. They shudder so bad. Have you asked Rich if you can exchange them? Yeah, last year. Never got a response. That's pretty poor customer service. I'm not sure if the quality has gone down as I've heard others complaining about them now too. I got my set of RotorPro's through a group buy years ago and must have got lucky. 20k miles later they're still ok. 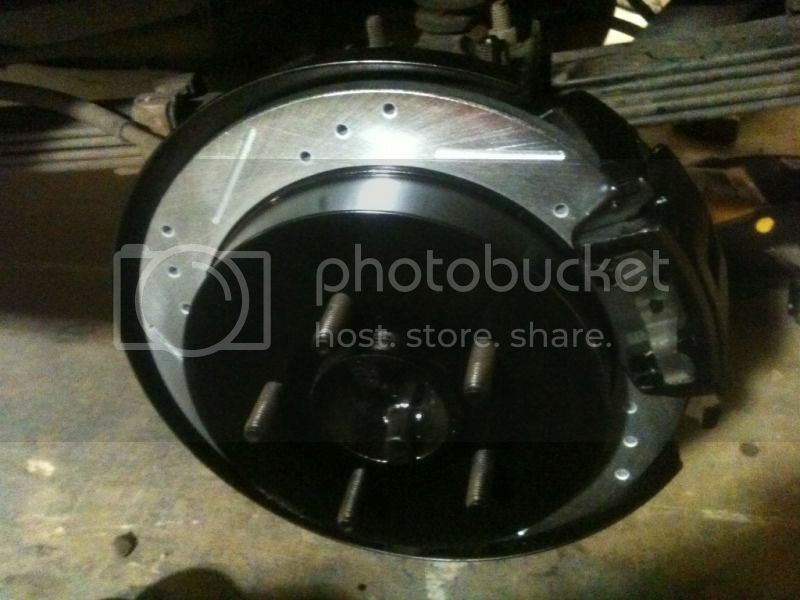 I know that they are stock size and all but if anyone has ever priced a big brake kit from any of the better known brands out there you'll quickly realize that you are barely going to get one wheel done vs. the $350 for the ful set of RotorPro's. The price is probably the best thing about them and they look and perform decent too with the dimpled and slotted style. I'm wondering if the shaking is the rotors now. I don't feel it at all while braking. Only when driving from 48-60 mph. I'm getting my front end checked out soon. Yep. Pretty sure I made a thread too. We had a set on our first HD with no issues until about 100K after install...superficial cracks developed around the drill holes. We bought another set for the fronts. I thought we got our moneys worth out of them. Tonight I put a another four on our new/used HD with EBC's... very happy! I don't care what brand you get, most of the time you will see cracks around the holes of the cross-drilled type rotors. That's why I've seen most on here recommend getting the dimpled and slotted. You lose the extra cooling that the cross drilled gives you but you still retain the look and more importantly longevity of the rotor.